The Biennial Reader was created in response to the desire of the municipal government of the Norwegian city of Bergen to organize a biennial of their own. The Kunsthall Bergen, which the city had approached in this regard, had the courage to turn the question around. At the height of the proliferation of biennials and similar events throughout the world, the Bergen art hall first wanted to thoroughly examine the biennial phenomenon and its implications. What was intended to have been the first Bergen biennial in the autumn of 2009 was therefore tactically replaced by an international conference with the telling motto, ‘To biennial or not to biennial?’ During the preparations for this event, the lack of substantial literature, analysis and theorizing on the biennial phenomenon became evident, so the art hall decided to compile this reader. Both the conference and the book are a confirmation of ‘the discursive turn’, the shift from practice to discourse within the visual arts described by Paul O’Neill in this anthology (pages 240 to 259). 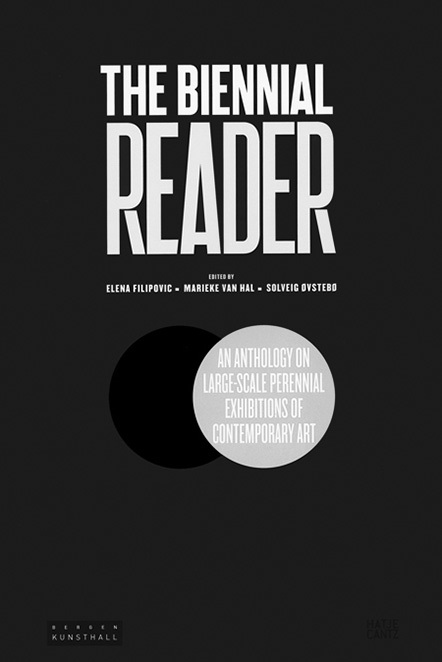 The Biennial Reader is divided into five sections logically following one another. The first is a selection of essays analysing the history of the phenomenon (‘Histories, Precedents and Origins’). The second section (‘What Is a Biennial? Potentials, Functions, and Ideals’) examines the role of biennials and the expectations that people have of such large-scale exhibitions. The third (‘The Curatorial’) covers the protagonist of the contemporary biennial world, namely the (independent) curator. The authors included in section four (‘Rethinking Biennials: Models and Formats’), indicate possible new models and strategies for this type of international exhibition. The last section (‘The Politics of a Global Art’) places the phenomenon of ‘biennialization’ within the perspective of increasing globalization. From the very first essay, it is obvious that the editors have not taken the easy path of unequivocal interpretations or consensus. A reading of the first section, for instance, makes us aware that the genesis of the contemporary biennial can be described in different ways, and that the first art biennials in Havana may actually be more representative of the current exhibition format than the prototypical Venice Biennale. The uncertainty generated by the combination of essays in the first section continues throughout the rest of the book. The reader is caught up in a pendulum swing between proponents and opponents, pros and cons. In this dichotomous chain of standpoints, the biennial at one moment is merely a part of the market and an instrument of crass capitalism, while at another the phenomenon offers a platform for political engagement and cultural responsibility. One time, the mega exhibition stands for Debord’s ‘society of the spectacle’, in which the visiting masses are benumbed with simple entertainment; another time it offers a veritable public space for dissensus and democracy. The biennial is the ideal example of cultural homogenization driven by the West on the one hand; on the other, it is the ultimate place for artistic pluralism and cultural diversity. It can be an ideal means of promoting the egos of curators, only the next moment to be a noble vehicle for teaching and even emancipating people. Are curators more like bloodthirsty colonizers who occupy as-yet-unexplored artistic territories or cleverly claim ideas to build up their own careers, or are they peace-loving anthropologists who want to promote more understanding of other cultures and artistic practices? Does the rampant ‘biennialization’ phenomenon mean the imposing of Western universalism, or a decentralization of the artistic power centre? The plethora of polyphonic and contrapuntal voices does not mean that this 512-page reader lacks nuance. What especially stands out is its broad scope, which extends far beyond the realm of the artistic. The writers in The Biennial Reader readily discuss economic, social, political and aesthetic issues such as commoditization, representation, democracy, neoliberalization, identity politics or geopolitics. Nowadays, art or artists hardly have a part in this debate. In this book, they have even less of a voice. Of the 32 writers whose essays have been included, only 1.5 of them are artists. Not that that half of an artist is mediocre, but he only counts for half because in addition to his artistic practice he is also a curator and writer. This proportion raises the question of whether artists today no longer have a critical voice in the world in which they operate. And what about the opinions of autonomous critics? This anthology confirms the present hegemony in the globalized art world. Nowadays it is not the artist or independent critic who determines the prevailing discourse, but the so-called ‘independent’ curator. The professional label of the latter covers a lot of territory, however. For ages now, the image of this – preferably nomadic – art professional has in no way resembled that of the somewhat withdrawn caretaker of museum art works. Curators today are aestheticians, diplomats, economists, critics, historians, politicians, audience developers and promoters, as Michael Brenson indicates in his contribution to the book (page 223). In short, curators are generalists, who moreover regard their own activities with the necessary reflexivity. Thanks to this broad interest shown by curators, the reader is treated to a rich and intelligent discourse that not only attests to their wide-ranging social knowledge but also to their involvement and engagement. For those who want to keep abreast of the relevant discourse in today’s biennial world, this anthology is required reading. The fact that this book is also the first extensive publication on large-scale international art exhibitions only makes it a more vital resource. Yet the dominant voice that curators have in this book is not unproblematic. The advantage of involvement and practical experience simultaneously holds the risk of over-involvement or too little distance. This is also true of the selection of essays in this anthology. Although by now the biennial has a history of more than 100 years, the selected essays examine a notably recent period. Moreover, the majority of these curator-authors are part of the same sub-network, familiar to insiders. In other words, just like the present art world, this reader suffers from the doxa of contemporaneity. But the position of curators, who simultaneously are organizers, promoters and their own critics, raises a more fundamental question. From this hybrid position, in which criticism to a considerable extent is reduced to self-criticism, can you still speak of a genuine agony and thus of a true public space? Or do curators have enough independence to shatter their own crystal palaces?